Pam Weber was born and raised in Kitchener, Ontario. She graduated from University of Guelph in 1979 with a Bachelor of Arts degree, with a Fine Art major. At Guelph, Pam studied a wide variety of art mediums, from figurative drawing to sculpture. However, it was printmaking, under the direction of accomplished printmakers Walter Bachinski and Gene Chu that gave her the greatest challenge and satisfaction. In printmaking, Pam found, what was for her, in art, an ideal balance between the creative artistic vision and the importance of following a measured process. Not surprisingly, upon graduation Pam started working in the commercial printmaking business. In 1981 she started Oink Ink Productions, a screen-printing company, with her business partner in Kitchener. This venture allowed her to combine her creativity with the challenges of owning and operating a successful business. 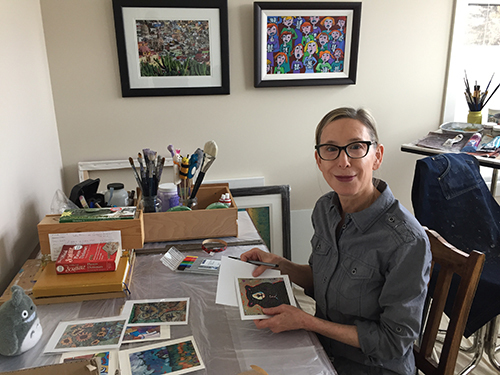 In 1984 she married and moved to Ottawa, where she continued to study lithography, serigraphy, and graphic art, at the Ottawa School of Art and Algonquin College. While employed as a production artist at a screen-printing enterprise, and later a publishing company, she still managed to get involved with the local art community. Pam also had a brief stint as an opaque artist, applying her brush to acetate film, for Hinton Animation Studio, the producer of The Raccoon series. Gradually, Pam changed her medium from printer’s ink to mixed media and collage, finally to acrylic paint. In acrylic paint, Pam found a long-running medium in which to create her signature bold and colourful images. In the summer of 1995 she moved to Calgary with her husband and three sons which provided an environment to explore a new and, for her, a compelling new subject matter, the Western landscape. She is an active member of the Alberta Society of Artists, Calgary and an associate member of the Federation of Canadian Artists, Vancouver. Her unique style, vibrant palette, uplifting imagery offers the viewer a joyous escape into her world. Pam’s work is available in commercial galleries in Alberta and B.C. Even though my finished pieces have been described as whimsical; often incorporating humour, I am very serious about painting. I am serious about playing and having fun on my canvas no matter what the subject matter. A sense of joy to the viewer, uplifting visuals, is what I want to accomplish when I load my brush with paint. My process is methodical in practice: I draw with graphite, once I’m happy with my image then I apply the acrylic paint, layer upon layer which often includes mark making and stencilling. I take great satisfaction in working with my hands. Heavy outlines draw in the eye and the complexity of the surface holds the gaze. If my bold, vibrant palette and natural or fabricated world subject matter puts a smile on your face it makes it all worthwhile.